Reviews of, and analyses of the capabilities of, VR-relevant hardware. Apparently, there were good sales numbers for VR equipment prior to the holiday season, and therefore a host of new VR users are coming in just about now. This meta-post collects a bunch of stuff I’ve written (or presented) in the past that might be of interest to some of those new users. These questions/answers are not hardware-specific, meaning they apply to any current-generation VR system (Oculus Rift, HTC Vive, all the Windows Mixed Reality headsets, PlayStation VR, …), and go beyond basic tech questions such as “how do I plug this in, install drivers, …). How does VR actually work? (presentation at VRLA ’16 Expo, 25 minutes) In other words, how does a collection of screens and lenses and tracking sensors etc. create the illusion of a virtual space that feels real? Why do VR headsets have lenses, or how is it possible to see anything on a pair of screens that’s only an inch or so in front of ones eyes? Why do things in VR look blurry when I bring them close to my eyes? 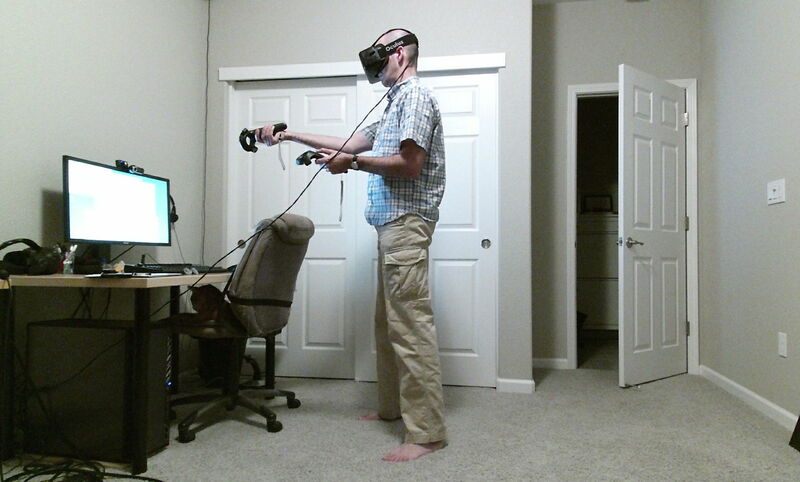 There is one other issue for which I do not have a full article, but it’s quite important for new users: VR sickness (aka motion sickness, simulator sickness, …). Today’s VR headsets, at least the ones doing full head tracking (that means Rift/Vive et al., and not Gear VR, Oculus Go, Google Cardboard, …) should not cause VR sickness per se. These days, it is primarily caused by artificial locomotion in games or applications, as I explain in the second presentation I linked above. The important message is: do not attempt to fight through VR sickness! If you try to stomach it out, it will only get worse. Stop using VR the moment you feel the first symptoms, take a long break, and then try again if you want to continue with the application/game that made you sick. If you try to power through repeatedly, your body might learn to associate sickness with VR, and that might cause you to get sick even when merely thinking about VR, or smelling the headset, or similar triggers. Just don’t do it. That’s about it; now go ahead and enjoy your shiny new VR systems! 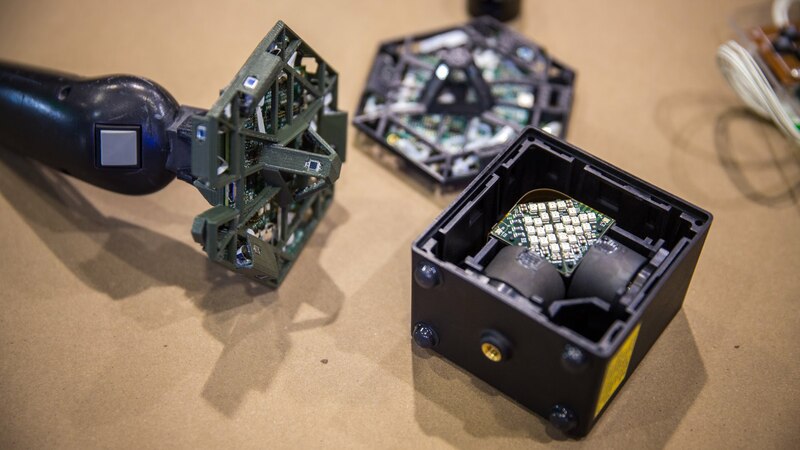 How exactly does HTC Vive’s Lighthouse tracking system work? How are tracking results from optical systems such as Constellation and Lighthouse combined with results from inertial measurement units to create smoother and more stable tracking results with less latency? I wrote an article earlier this year in which I looked closely at the physical display resolution of VR headsets, measured in pixels/degree, and how that resolution changes across the field of view of a headset due to non-linear effects from tangent-space rendering and lens distortion. Unfortunately, back then I only did the analysis for the HTC Vive. In the meantime I got access to an Oculus Rift, and was able to extract the necessary raw data from it — after spending some significant effort, more on that later. With these new results, it is time for a follow-up post where I re-create the HTC Vive graphs from the previous article with a new method that makes them easier to read, and where I compare display properties between the two main PC-based headsets. Without further ado, here are the goods. The first two figures, 1 and 2, show display resolution in pixels/°, on one horizontal and one vertical cross-section through the lens center of my Vive’s right display. 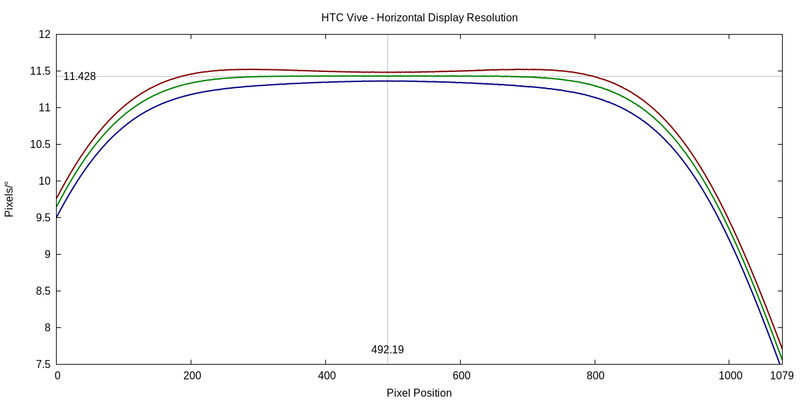 Figure 1: Display resolution in pixels/° along a horizontal line through the right display’s lens center of an HTC Vive. 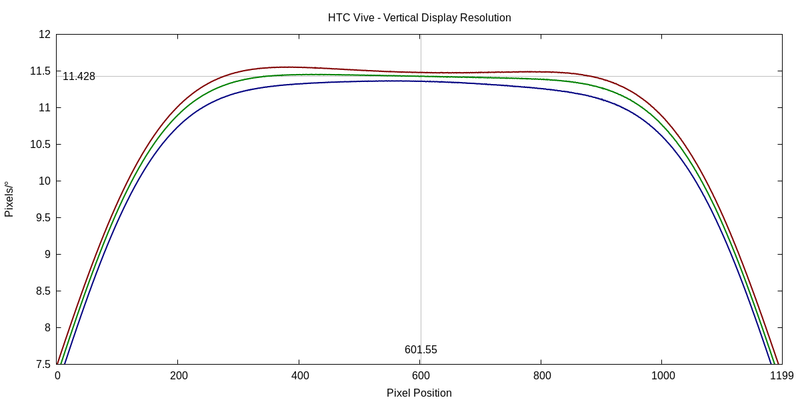 Figure 2: Display resolution in pixels/° along a vertical line through the right display’s lens center of an HTC Vive. What is the real, physical, display resolution of my VR headset? I have written a long article about the optical properties of (then-)current head-mounted displays, one about projection and distortion in wide-FoV HMDs, and another one about measuring the effective resolution of head-mounted displays, but in neither one of those have I looked into the actual display resolution, in terms of hard pixels, of those headsets. So it’s about time. The short answer is, of course, that it depends on your model of headset. But if you happen to have an HTC Vive, then have a look at the graphs in Figures 1 and 2 (the other headsets behave in the same way, but the actual numbers differ). Those figures show display resolution, in pixels/°, along two lines (horizontal and vertical, respectively) going through the center of the right lens of my own Vive. The red, green, and blue curves show resolution for the red, green, and blue primary colors, respectively, determined this time not by my own measurements, but by analyzing the display calibration data that is measured for each individual headset at the factory and then stored in its firmware. 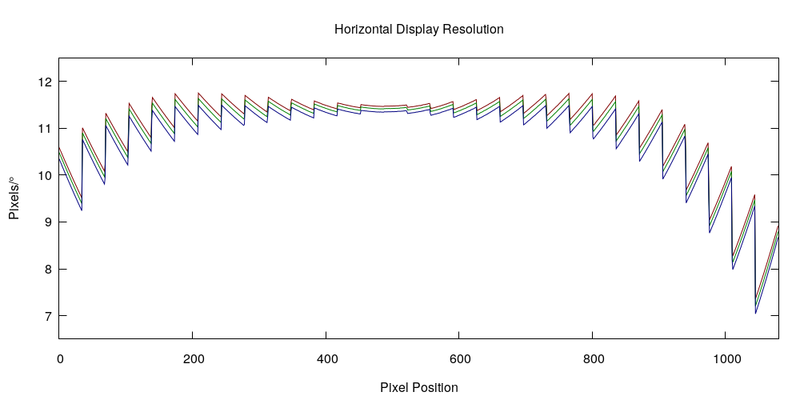 Figure 1: Resolution in pixels/° along a horizontal line through my Vive’s right lens center, for each of its 1080 horizontal pixels, for the three primary colors (red, green, and blue). 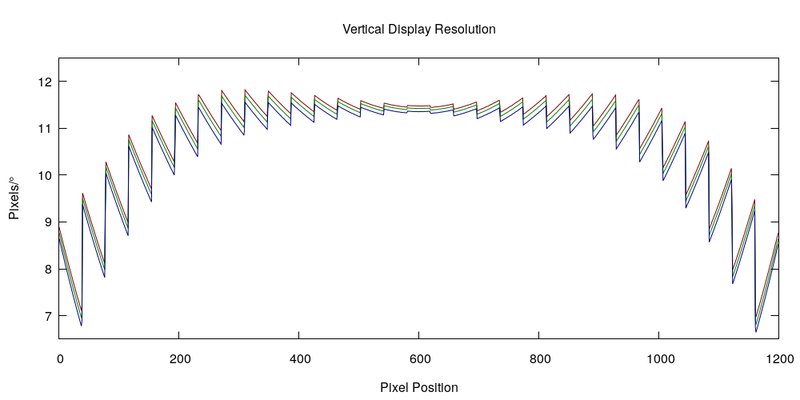 Figure 2: Resolution in pixels/° along a vertical line through my Vive’s right lens center, for each of its 1200 vertical pixels, for the three primary colors (red, green, and blue). At this point you might be wondering why those graphs look so strange, but for that you’ll have to read the long answer. Before going into that, I want to throw out a single number: at the exact center of my Vive’s right lens (at pixel 492, 602), the resolution for the green color channel is 11.42 pixels/°, in both the horizontal and vertical directions. If you wanted to quote a single resolution number for a headset, that’s the one I would go with, because it’s what you get when you look at something directly ahead and far away. However, as Figures 1 and 2 clearly show, no single number can tell the whole story. Why does everything in my VR headset look so pixelated? It’s supposed to be using a 2160×1200 screen, but my 1080p desktop monitor looks so much sharper! This is yet another fundamental question about VR that pops up over and over again, and like the others I have addressed previously, it leads to interesting deeper observations. So, why do current-generation head-mounted displays appear so low-resolution? Here’s the short answer: In VR headsets, the screen is blown up to cover a much larger area of the user’s field of vision than in desktop settings. What counts is not the total number of pixels, and especially not the display’s resolution in pixels per inch, but the resolution of the projected virtual image in pixels per degree, as measured from the viewer’s eyes. A 20″ desktop screen, when viewed from a typical distance of 30″, covers 37° of the viewer’s field of vision, diagonally. The screen (or screens) inside a modern VR headset cover a much larger area. For example, I measured the per-eye field of view of the HTC Vive as around 110°x113° under ideal conditions, or around 130° diagonally (it’s complicated), or three and a half times as much as that of the 20″ desktop monitor. Because a smaller number of pixels (1080×1200 per eye) is spread out over a much larger area, each pixel appears much bigger to the viewer. Here is an update on my quest to stay on top of all things “holo:” HoloLamp and RealView “Live Holography.” While the two have really nothing to do with each other, both claim the “holo” label with varying degrees of legitimacy, and happened to pop up recently. At its core, HoloLamp is a projection mapping system somewhat similar to the AR Sandbox, i.e., a combination of a set of cameras scanning a projection surface and a viewer’s face, and a projector drawing a perspective-correct image, from the viewer’s point of view, onto said projection surface. The point of HoloLamp is to project images of virtual 3D objects onto arbitrary surfaces, to achieve effects like the Millenium Falcon’s holographic chess board in Star Wars: A New Hope. Let’s see how it works, and how it falls short of this goal. Creating convincing virtual three-dimensional objects via projection is a core technology of virtual reality, specifically the technology that is driving CAVEs and other screen-based VR displays. To create this illusion, a display system needs to know two things: the exact position of the projection surface in 3D space, and the position of the viewer’s eyes in the same 3D space. Together, these two provide just the information needed to set up the correct perspective projection. In CAVEs et al., the position of the screen(s) is fixed and precisely measured during installation, and the viewer’s eye positions are provided via real-time head tracking. I spent the last couple of days at the first annual meeting of “The Higher Education Campus Alliance for Advanced Visualization” (THE CAAV), where folks managing or affiliated with advanced visualization centers such as KeckCAVES came together to share their experiences. During the talks, I saw slides showing Vrui‘s Collaboration Infrastructure pop up here and there, and generally remote collaboration was a big topic of discussion. During breaks, I showed several people the following video on my smartphone (yes, I finally joined the 21st century), and afterwards realized that I had never written a post about this work, as most of it predates this blog. So here we go. To my surprise and delight, I recently found out that Valve has been releasing Linux versions of most of their SteamVR/OpenVR run-time/SDK for a while now (OpenVR just hit version 1.0.0, go get it while it’s fresh). This is great news: it will allow me to port Vrui and all Vrui applications to the Vive headset and its tracked controllers in one fell swoop. But before diving into developing a Lighthouse tracking driver plug-in for Vrui’s input device abstraction layer, I decided to cobble together a small testing utility to get a feel for OpenVR’s internal driver interface, and for the Lighthouse tracking system’s overall tracking quality. Figure 1: The Lighthouse 6-DOF tracking system, disassembled (source).